Leaders find lessons in the most unexpected places. Adam Cooper, our Chief Legal Officer, is not only a lifelong Cubs fan, but also an admirer of how the team’s leaders have pulled off an historic turnaround in performance. 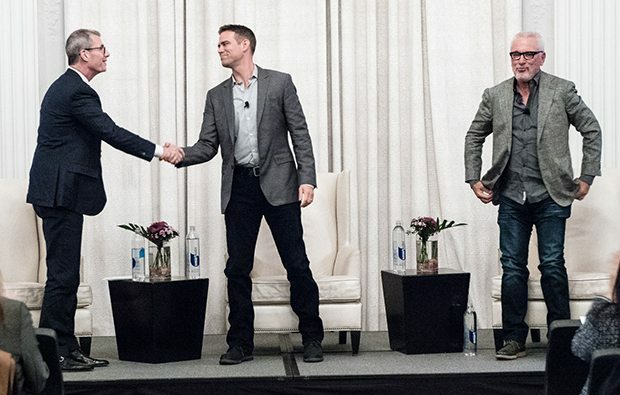 As part of Citadel’s guest speaker series, which brings the firm’s team members face-to-face with icons in business, technology, and beyond, Adam sat down with Cubs’ President Theo Epstein and Manager Joe Maddon to learn how they transformed the team’s performance and how anyone can apply those lessons to their careers. We caught up with Adam to see how he was preparing for his moment with the Cubs’ leaders. Editor: So Adam, you’ve been waiting for this chance to talk with the Cubs since, what, age 8? Is this easier or harder than sitting down for the bar exam? Adam: (Laughs). Well, I grew up watching Ernie Banks. And the thing about Ernie was that he was known for his optimism. No matter the situation, he always gave it his best. So that’s the attitude I’m taking into today’s event. Editor: You played baseball growing up. What was your favorite position? Adam: Definitely catcher. The catcher’s role can teach you a lot about how complex systems work. Catchers can see the entire field, so they quickly learn how a small moment in one location can ripple out and affect what’s happening in another. Adam: That’s right. And there are actually a lot of parallels between baseball, math, and financial services when you look below the surface. Baseball’s a game of scenarios. Lefty versus righty. Man on with two outs. Man on with a batter who has a full count. And of course all of those situations can be quantified. Our industry is similar. It’s about researching scenarios, designing strategies and seizing opportunities based on them. Teamwork is another parallel. Both worlds require you to get a large number of people, each of whom has a different specialization, to work together to achieve something no one person could do alone. The Cubs have a well-defined set of principles they call the “Cubs Way” that they’ve put on paper and apply daily to nearly every facet of their operation. The team here at Citadel has done that too, especially with an eye towards instilling a sense of integrity into our culture, processes, and training.